Where do women poets stand today? How do they live? What makes them write and perform? On the international festivals I was invited to over the past years I talked to many poets and poetry festival directors discussing these topics. To write poetry, to read, to organize events, nowadays this became quite often a political act. Poets still live in an ivory tower but are at the same time activists in public space, which is the source of the relevance and variety of their products. In my perception, the Schamrock-Festival is a great and vibrant installation. (Schamrock is a word made-up from German Scham meaning shame and Rock meaning skirt but referring also to Rock'nRoll). Much in the sense of Japanese poet Takiguchi Shūzō Poetry is Action: bringing together women poets, enabling creative exchange, exploring the many potentials of poetry: to connect cultures, to cross borders of languages and generations, to transport language into other art forms. To bring up what can't be said otherwise, to establish a space for omission, the mysteriousness of speech, becoming a flexible poetic muscle. And to celebrate for three days all we have in common. There are only few companies and media to publish, review and discuss poetry. By and large poetry remains a niche product for enthusiasts and poetry web-portals. All the more important it is for me to establish the Schamrock-Festival, to cooperate with other international festivals and platforms, to engage in a broad public discussion, and to continue to network and grow. 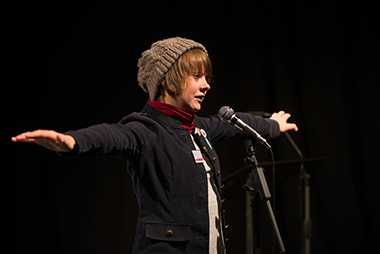 The third Schamrock-Festival of Women Poets presents a wide range of contemporary poetic expression and cooperation with other art forms: performance, concert, a word-sound workshop in Munich and a class at the Vienna poetry school. First of all we thank the Kulturreferat der Landeshauptstadt München, the Cultural Department of the City of Munich, who supported salon and festival from the very beginning. We would like to thank the cultural and literary institutions in eighteen countries supporting us both financially and with ideas and moral support. Enjoy the abundance, the variety and the meetings with more then fifty poets and presenters at the four festival days in Vienna and Munich!